The Lemosho Route is a very beautiful and unspoilt route that still enjoys sighting of wild game along the forest section. For those seeking a quiet route away from the crowds it clearly a superior option for the first two days of movement. Thereafter however, the route is precisely the same as the Machame Route. The start point of the Lemosho Route is particularly inaccessible during the wet season and climbers should be prepared to walk the final 2-5 kilometres of the road following heavy rains. The journey time to reach the start point is quite long and joined to the possibility of not reaching the end of the road by vehicle head torches may well be needed to reach Forest Camp on day 1. On day two the route ascends towards the eastern side of the Shira Ridge, the third summit of Kilimanjaro, before bending left to round the north side of the Shira Ridge and attain the Shira Plateau, pictured at the bottom of this page. Having crossed the Shira Plateau and reaching Shira 2 or Shira Cave Camp, the conventional Lemosho Route is precisely the same as Machame, however, Team Kilimanjaro has pioneered its own Lemosho Route that moves north round Kilimanjaro’s summit cone, avoiding all the crowds and enjoying a very quiet assault from School Hut. The descent is along the Mweka Route, a descent-only route. If Machame is crowded the conventional Lemosho Route loses its advantage by day 3 so it’s necessary to decide whether the additional costs involved with the Lemosho Route are worthwhile, or whether the TK 7 day Rongai Route or 8 day TK Lemosho Route might instead be better options. Another method of avoiding crowding is to combine Lemosho with the Western Breach assault, which we are very happy to arrange, providing the climber making the booking makes it clear to us in writing that he or she is aware, as is the rest of the group being represented, that it is understood that there is an ongoing potentially fatal risk of rockfall on the Western Breach and that the group is willing to expose itself to such risks on the basis of informed consent. After breakfast we continue as the trail steepness gradually increases and enters the giant heather moorland zone after several streams are across we continue over shira ridge the gently down wards to shira camp 3505)m located by a steam on the Shira plateau time 6-7 hour 755m. A gentle hike a cross the plateau leads to Shira 2 camp (3810)m on moorland meadows by a stream A variety of short hikes are available on the plateau making this a good acclimatization day trekking time is 3-4 hours. From the shira plateau we continue to the east passing the junction near the park of Kibo. As we continue our direction changes to the south east tower the lava called “shark tooth” shortly After the tower we come to the second junction which brings up to the arrow glessier (4876m). We now continuer down to the Baranco hut 3860) 6-7 hours. We start the day by descending into the start of the great Baranco a huge ravine. We then exit steeply up what has been tarmed the breakfast wall. It is a climb over rocks not technical but long and tiring passing under neath the heim and kersten glaciers we head towards the Karanga Valley 4000m for overnight trekking time is 3-4 hour. 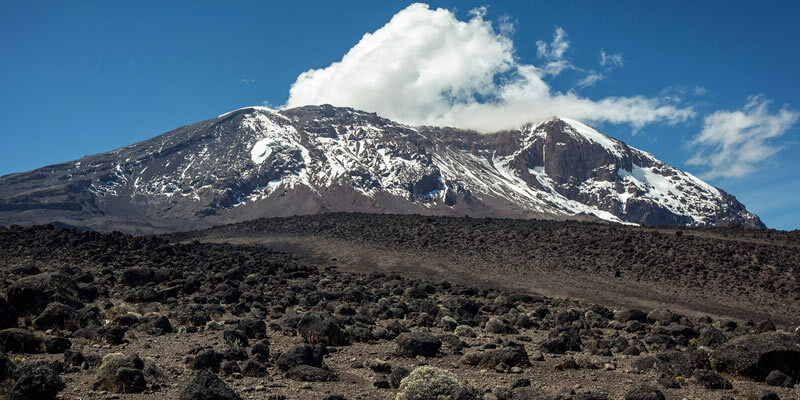 After breakfast we leave the Karanga valley and pass the junction which connect with the Mweka trail we continued to barafu hut (4600m) you have complete the south circuit which offers views of the summit from many different angles here we make up rest enjoy dinner and prepare for summit climb. Walking steeply up wards to summit glaciers you will climb for 5-6 hours but you gain in credible height over a short distance the view are spectacular. We should be on the crater rim at stella point (5750m) as the first rays of the sun emerge spectacular ice cliff within the crater surround you will view Mawenzi peak and beyond a breath taking another hous walk take us to our good the summit of uhuru 5895m highest point in Africa. We begin the descent by returning to stella point and then descend on scree slope back to Barafu camp for breakfast and a rest before finally heading down to millennium camp (3000m) for a well – earned rest on our descent we have fabulous views of the plains Mawenzi peak. A gentle trek takes us down through the rain forest to the mweka gate (1640m) where we complete park formalities and you will see our vehicle and then transfer back to Moshi for resting.